My passion to create art, hit me out of the blue. After retiring from a demanding career as a mortgage loan officer, I decided to take a watercolor class at the local college. There were many artists in my family but I never had an interest in art and like many people, felt I had no talent. Enter, M. Douglas Walton from Ruston, Louisiana. A year after my watercolor class, I had the opportunity to take a five-day workshop from M. Douglas Walton. My creative, right brain, was awakened and the world became a more beautiful place. I will be forever thankful to Douglas for lighting that fire and helping me find my passion. Painting for me is a way of expressing emotions and ideas that I am unable to express in any other way. Sometimes I paint more realistic paintings and other times my work is abstract. Many people find it very strange that I don't focus on one style or one media the way many artists do. When I paint I feel free. I can be unedited, daring, soulful, playful, spiritual, sentimental, insightful..whatever I am feeling, I pour into the painting. I work with many different types of media because I find so much joy in the discovery process. The common thread that runs through my artwork is the use of bold color, texture, and a sense of mystery. Creating and conversing through art excites me. It's like being a kid again and telling a secret, in code, to your very best friend. I have been told that I am all-over-the-place, and that I have so many styles of painting that my shows tend to look like they are group shows. Not the work of one artist. You paint who you are; good or bad, I am all of those artists. And I'm okay with that. I hope that my story will inspire others to find a creative outlet if they don't already have one. Spending time in the right side of your brain is nothing short of magical. 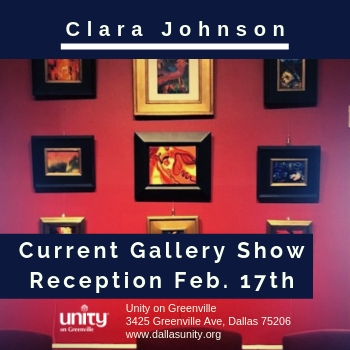 Dallas artist, Clara Johnson relocated from Midland, Texas five years ago. Her journey as an artist started ten years ago when she retired from her career as a mortgage loan officer. During the last ten years, she has taken numerous college art classes and over 30 art workshops. Her creative, colorful, works of art are bold and full of mystery. Before leaving West Texas, she participated in 4 solo shows, 16 group shows, won three awards, and was the feature artist at the Tall City Blues Fest. Since her move to Dallas, she has been juried into the Dallas Arboretum's annual sprint art show, Artscape, for the last 5 years. 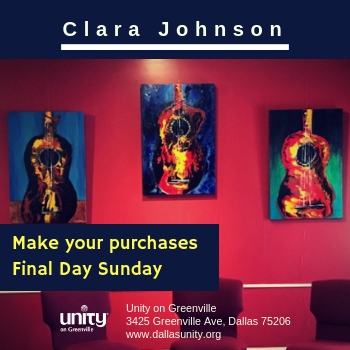 She has been part of the fall White Rock Lake Artists' Studio Tour for the last 4 years and has participated in 4 group shows. Her work is collected throughout the United States.